Dwarves are a taciturn, stoic and generally insular people but they also prize honor and loyalty even in strangers. They are lovers of mountains, caverns and all things deep in the earth, and it is with stone and metals that their artistry and dreams find form. 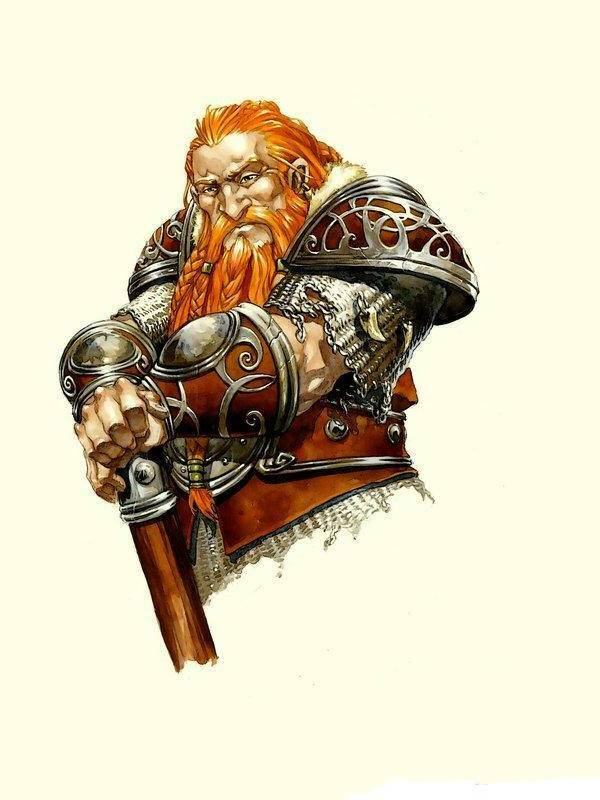 Dwarves are broken up into three general groups: Mountain Dwarves, Hill Dwarves, and Duergar or Deep Dwarves. They range in height from 4’ 0” tall to 4’ 9” in both males and females. On average, they live between 250-350 years. Dwarves gain a +2 to their Constitution and a –1 to their Charisma and Dexterity. Due to their short stature Dwarves move at ½ the standard move rate but this same stocky build permits a Dwarf to carry +25% more before becoming encumbered. Over their long lives they learn the languages of friends and enemies. As such all Dwarven characters start with a proficiency in Dwarven, Taurentine, Goblin, Ork, Vorgeel, the common tongue, and Rune LoreDwarves are as close to living expressions of the planet as you are likely to find and as such they resist the foreign magiks that infuse the Prime Material Plane. They are distrustful of “unnatural” magik and thus shun any classes that employ them. They receive a bonus of +1 against spells and magikal effects directed at them for every 3 ½ points of Constitution, whether for good or ill. Likewise they suffer a similar penalty to their Magikal Essence Score using the same matrix. Furthermore, Dwarves have exceptional resistance to toxic substances. The same bonus of +1 per 3 ½ points of Constitution also applies to saves vs. poison. The Dwarven race is a warrior culture, and harbor deep hatred of certain races with whom they maintain longstanding feuds. Whenever they encounter Goblins, Orks, or Vorgeel (bugbears) they get a +1 to hit. When in battles against ogres, trolls, and giants, these enemies subtract 4 from their to-hit rolls against Dwarves. The Dwarves have developed two unique weapons over the centuries. The first is the Dwarven Battle Axe. This two-handed Battle Axe is specially weighted for Dwarves and inflicts 1-10 / 2-12 in damage. The second is the Dwarven Throwing Hammer. The hammer too has a unique weighting and can be thrown up to 40 feet indoors and its ranges are extended as follows: 1-15 feet short, 16-25 medium, and 26-40 long range. These weapons can only be made and damage to them can only be repaired by Dwarven or Master Weapon smiths. Though Dwarves shun magikal incantation they have embraced the use of Rune Magik, which is more akin to Talismanic power. Of all the races on Aeres today Dwarves may know more about Runes and Rune Magik than any others with the exception of Trolls and Dragons. Dwarves have made an art of using Rune Magik to imbue weapons, armour and other items of value with great power. Many are the tales of the Rune Masters who work with the smiths in the Dwarven halls singing their chants while the hammers are ringing. Dwarven resistance to Magik does not extend to Rune Magik and weapons or effects generated from Runes are saved against normally just as with Talismans.